Senyorita Lakwachera: Mezza Norte opens in Trinoma. Mezza Norte opens in Trinoma. Last weekend is a foodie full week for me, one of the highlight I got was a privilege to be invited in the launching of Mezza Norte in Trinoma Mall. 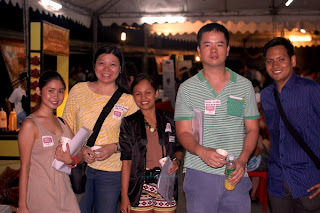 Mezza Norte is a midnight food market organized by The Mercato group together with other popular midnight food markets like Midnight Mercato in Bonifacio Global City, Taguig, Cucina Andare in Glorietta Park and the recently opened Cosina Centrale in Angeles City Pampanga. Mezza Norte is one of the biggest midnight food market I’ve ever seen with the widest choices in terms of vendors and variety of foods. This place always reminds me of late Bancheto which became popular in Ortigas Business Center it just that it’s all for foods. Going back, this weekend night market is becoming a dearly amusing to many in the metro in fact it is becoming equally popular destinations of tourists. The respond of the buyers pays the groups' effort and success on delicately choosing the vendors via a taste test to ensure the uniqueness of each, and guarantee buyers ultimate experience. Their grand opening in Trinoma started early, when I arrived the place is almost full with shoppers who is already starting to enjoy their grabs together with good musics. I started roaming around to experience the best of each vendor and I opted to start in some sweets. I need this to balance my appetite since I easily get full with meats, kebabs and appetizers Mezza Norte has a lot of sweets to chose from, some are really good pasalubong, a must grab for kids and kids alike. Since I went there earlier, the heat of the day light is still sinking to me so I got some coolers to neutralize the temperature Love this pure buko pandan juice from Edgy's Foodtrip, I love the fact that they don't add preservatives. The gourmet hotdog sandwiches from Schmidt's is best paired with Lariza's Juice ( the Manggang tagalog to be specific). They also offer good choice of homemade dishes from seafoods to local pancit. And for those who just need something to munch while shopping, you will surely enjoy this cute concept of bite size tacos from FMT Tacklings and takoyaki. Alright, still got some on my bucket. Next good pair I got is the Merry Moo Ice cream owned by Kelvin Ngo (love their grey leaf tea flavor and dark chocolate) and the go healthy potatoes in cheese by Green Minded. Not full yet? go meaty! Lastly for the dessert, Mezza Norte has a lot of cakes for you, I personally love the Pistachio cake from Cakes by K.
Together with the founders, everyone becomes a part of their celebration for its early success. You can come and visit them every weekend to experience it yourself. Mezza Norte the premier Food and Lifestyle Market in the North. Opens every weekend (Friday, Saturday, Sunday 4pm to 3am) at the Mindanao Open Parking, Trinoma Mall. 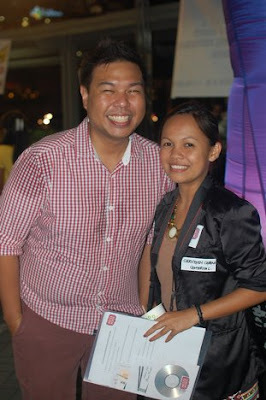 Thanks Jam for the photo below with Anton Diaz of Our Awsome Planet and Nowie Potenciano owner of my favourite Mochiko. Another great news for those who are living around Pasig City, Mandaluyong, Quezon City specially the workers and residents of Eastwood City Libis. Due to a high public demand The Mercato Group is bringing another brainchild closer to you details are on their press release below. 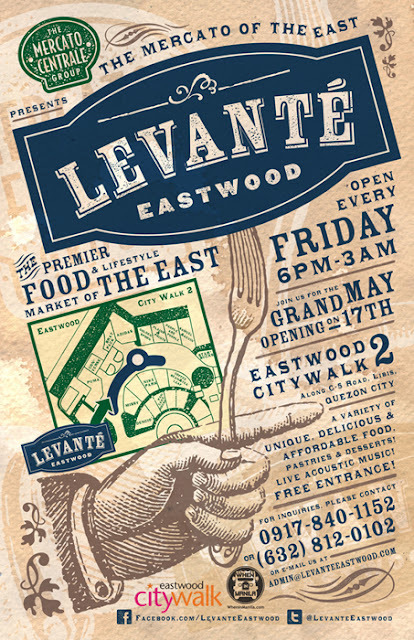 Culinary adventures await you at Eastwood’s Levante night and food market! Eat’s going to be a fun foodie adventure in Eastwood as the Mercato Centrale group, organizer of the premier food and lifestyle night markets around the metropolis, brings to you Levante – the newest night food market in Eastwood Citywalk 2. Grand opening is on May 17, Friday from 6pm to 3am. haha true :) gora na girl!